Tarot & Perspectives of a student. I have been having so much fun with the Book of Orion. Before starting studying all the symbolism within the Sebayts, I always wondered what would represent the sigil that is in three pages of 3 Sebayts and one of the symbols that caught my attention was the symbol of the Sun, which is represented in the sigil of Khafre and Menkaure. As you are aware, the tree of life is well represented with Tarot and is advised studying the tree by Thoth deck. Most cards to me is a mystery that I cannot even know where to begin to understand its symbolism, but after reading the Book of Orion and catch the Tarot to meditate, I came across a card that made perfect sense to me. Four of Disks - Power, when I saw the card I remembered just the same symbol that exists in sigil of BoO, the symbol of the sun, but with an interesting detail, the sun in Capricorn. Capricorn is the point at which the sun turns back to the north, the disks are represented as towers and now we all know how important the towers in castles is and even the importance that is revealed in the first secret of Orion including the card called "The Tower ". The four towers of the card (4 of Disks) are represented by the four elements: Air, Earth, Fire and Water which curiously are represented in the sigil of Orion. The castle has two main roads, at least in the main entrance and another secondary. The main entrance / exit depending on your interpretation is represented by Capricorn and the second by the sun and here I symbolize that the Sebayt of Khafre is the portal to life and Sebayt of Menkaure the portal of rebirth and inside of the castle symbolizes the life of mankind, the Malkuth level. It was interesting to see things from this perspective, it seems that the card gave a new vision of things, a different way to explore things, but the funniest and most fun came when I began to explore more of the card, I decided to explore the XIX card that is obviously represented by the sun. In Kabbalah the cabalistic path is: Hod - Yesod, unites the unconscious mind and the psyche of the moon with Hod (the glory). All we know that the sun is the main cause of the existence of life on Earth, and according to Aleister Crowley, the representation of the sun is made by the new lord of the new era: Heru-Ra-Ha, one of the many names of Lord Horus. under the sun is the two children who are also represented in the letters "The Fool", "The Hierophant", "The Lovers", come this time with wings of butterfly, the metamorphosis. Taking it for the term of Asetians and according to the teachings of the Asetian Bible, I can compare the butterfly to Phoenix, concept totally vampiric. I can also compare the two children of the card to the two sisters of Horus, living in harmony and unity, symbolizing the Love of the Children of Aset. Below the children, has two identical symbols; in my eyes is a symbol that exists in the book Kemet, on the temple of Edfu. 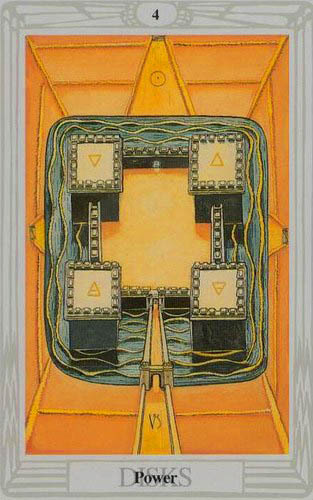 The card has too the 12 signs, according to the Asetiana culture is represented by Maat. 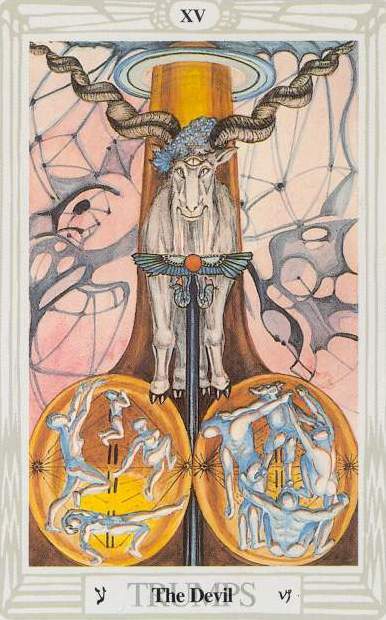 The card representing Capricorn is XV (The Devil). For now I do not feel very comfortable talking to the card, but according to the Book of Thoth, his energy is creativity in the twins serpents of Horus and Osiris. I may seem crazy and want to see all the symbolism about Asetianism in Thoth Tarot, but to me it is clear and makes sense see things in such perspective. Anywya, what do you think of this? Re: Tarot & Perspectives of a student. It seems that you have put a lot of thought into this. Why don't you feel comfortable talking about the wicked XV card of The Devil? I Will share later, Nightshade. Jonathan: Jonathan: I was exploring nature and meditation in the middle of the Atlantic. A week without mobile phone and computer. I was surprised that you were so silent in the forum now I can see why. Nightshade wrote: It seems that you have put a lot of thought into this. Why don't you feel comfortable talking about the wicked XV card of The Devil? I am thinking about you and your ask for long time. Please, accept my apologies. I am lost in my vision about this thread. Hope you understand that. So, don't wait for my reply soon. I could be wrong here, but the twin serpents may symbolize something other than Horus and Osiris. The aspect of twins in symbolism is usually yin to yang; light to darkness. Because Horus is the son of Osiris, they are similar, but not in the typical sense of balance you find within twins. Osiris to Seth is what one may be more likely to expect from a twin pairing, and conveniently they are also brothers. I could be wrong, and it could represent something like the dual aspects of Osiris. Not according to Asetianism. Horus is the son of Aset, Osiris is the Father of Anubis. Horus; in legend was created by Aset to take the place of his dead father. He was to fulfill the role of the king while Osiris was gone. He could be seen as a replacement Osiris, though, of course, they are very different. Osiris was the brother and husband of Aset, Osiris was murdered by Seth, his brother, who according to tradition mutilated and scattered the pieces of his body(Osiris) in Egypt. Aset found the fragments, which recovered, embalming and mummifying Osiris, bringing it back to life. Horus was the main responsible for the fall of Seth. According to legend, Seth took an eye to Horus, during a confrontation, which retaliated by castrating him(Seth) and leaving him sterile, accentuating the contrast between the two rivals, while Horus were assigned with the four sons: - Duamutef, Imset, Qebehsenuf, Hapi - Seth was referred to as the castrated. The cult of Osiris referred to initially as god of fertility, was invoked with the function of providing a good harvest and is also related to the flooding of the Nile. Became, with the popularization of the myth, the God of resurrection. Well represented in the Tarot card by The Fool. The Fool is represented by the god of Spring, Dionysus... If you go back in time, you'll see that Dionysus is only one copy of Osiris, because Osiris is the God of spring, often invoked by witches to have a good harvest, among others things... The grapes is the symbol of fertility, the good harvest. This card has so many symbolism, the dove, from a different perspective, I can say that represents Aset. Returning to the theme, Aset created the three Asetians in the Duat, Alone. You can check by yourself in the Asetian Tree of Life. Mary, Joseph and Jesus, this story is so well represented in the theology of Osiris, Joseph compared to Osiris the concept is the same. Who was the father of Jesus ... God or Joseph? Me too and such beautiful artwork. Full of riddles and symbolism. In fact there is nothing with off-topic here. Divine 277 shared a deep photo. If you look with more attention you will see the Djed Pillar. Nightshade: Regarding the letter XVI, may have nothing to do, But a few days ago while meditating on the Book Of Nun from Asetian Bible I noticed that the body of Nut has 15 stars. I found it interesting, because then I remembered to apply the method of numerology and 15 = 1 +5 = 6. In this case the letter is The Lovers. Anyway, from what I saw, Capricorn is one of three signs of the earth, we know that in the past, all worship are represented by a horned animal. We know that the horns is a very powerful symbol, so if we look at the horns that exists in the Dark Mark and their meaning can be inferred that this letter is a physical representation very connected to the earth.